Since my last post, I’ve been doing a lot of reading in order to revise an article for a journal. 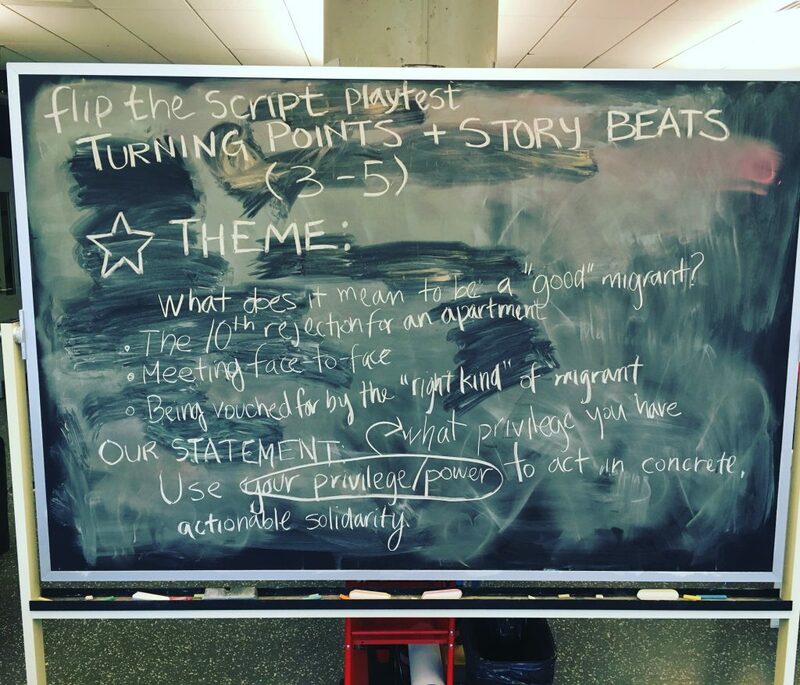 I also wrote a draft of the full rules for Flip the Script! The week before last, I got to talk about them with the Reflective Games Group, and run through some of the rules, which led me to rewrite my section on intersectionality. This week, we did a full playtest (which I recorded the audio for). The playtest went well, on the whole, but I was astounded to find that the run time was two hours, and I will have to find a way to streamline that amount of time in the future. It’s just too long to reasonably expect most festival players to commit to. The major revisions that I plan to make other than trying to streamline the introductory parts is to try to use the LED interfaces in a different way. Squinky and I had criticized another puppet interface for just being buttons on the puppets’ heads that did things in game, and it’s true that this interface isn’t as embedded into the puppets as I originally envisioned. The truth is that I didn’t want to embed the electronics in places where I couldn’t easily access them, in the end, and so we’ve got this current version where the electronics aren’t even really sewn onto the puppets. And I’ve made my peace with that — it’s a different game than what I thought it would be in terms of its use of technology. But, at the moment, there was very little reason for players to use the technology, and players rightly suggested that maybe offloading more onto the tech and getting it more involved would do good things for the game. It was also suggested that maybe I could have my own microbit to send signals, especially if the meaning of those signals changed (like perhaps the players could switch roles, or a new character is introduced — maybe I could make each of these into a more formalized rule for each round, sort of like the way that the games change in “Whose Line Is It Anyway?” — I don’t know why that specific reference comes to mind except that it’s the same general concept each time, with specific rules for each individual game/scene. Another interesting idea that came up was what it would be like to play my other nanolarps using puppets instead of having the players play themselves. It also occurs to me that I wound up using a blackboard to record notes from the session where all the players could see them this time, and that I will want to do that in the future. That means I’ll have to get a carry-on sized whiteboard (possibly at the dollar store, possibly a picture frame with plastic or glass in the frame?) to do so in the future. The subject that we wound up discussing in this game was the concept of the “good” migrant, explicitly asking “what does it mean to be a ‘good’ migrant?” To contextualize this, we were problematizing the idea of a good migrant while also recognizing that many nationalists and other people have expectations of what good migrants are, even if those expectations might be subconscious. We unpacked those in the context of apartment hunting. I feel good about the playtesting, though, again, astounded that it took so long. I figured it was time for a little update from my notes and documentation! So, since my last update, the project has moved forward considerably! I also presented my Reflective Games research on a panel which I chaired at CGSA (the Canadian Games Studies Association) and had some great questions about it from other scholars, and had the chance to chair a talk by Kara Stone about Reparative Game Design and Time (in many forms — queer time, crip time, deep time). We got a lot of good questions and feedback, and I felt quite recharged by the conference. Egh. As I opened the link to github with the intent of sharing my code repository, I found out about the news that github is being acquired by Microsoft, and I’m not too sure how to feel about that. Well, at any rate, the code lives there for now, so here’s a timeline of the progress since my last blog post, along with some short descriptions and pictures. After finishing Harle, my first puppet, I got to work on a puppet that I came to call Avi. The names of the two colours of fleece that I bought from Fabricville were Guacamole and Chai Tea, and reminded me of the colours of the inside of an avocado. So, despite the fact that Avi looks a lot like a turtle, their look is actually avocado-inspired. I was invited to an impromptu get-together at a friend’s house, and I knew that I would have a lot of hand-sewing to do, based on Harle. So, I machine-sewed everything possible ahead of time, and brought my pins, fabric, stuffing, needle and thread over to this friend’s house. I have found that I can watch, listen and speak while handsewing, and so while we conversed and others played board games, Avi’s body came together. The next day, I added features like Avi’s eyes and other details. 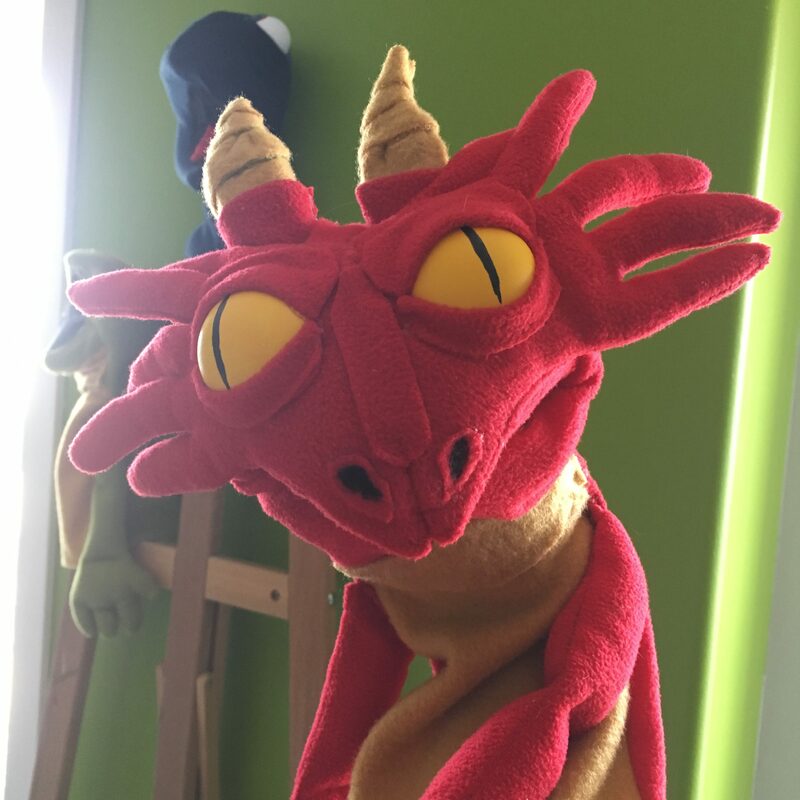 My friend Gina suggested that my third puppet should be a red dragon, complete with wings. I had been planning to use red fabric so that the puppets are each sort of in correspondence with CMY/RGB colour theory (Avi, while not Cyan, is both green and yellow). 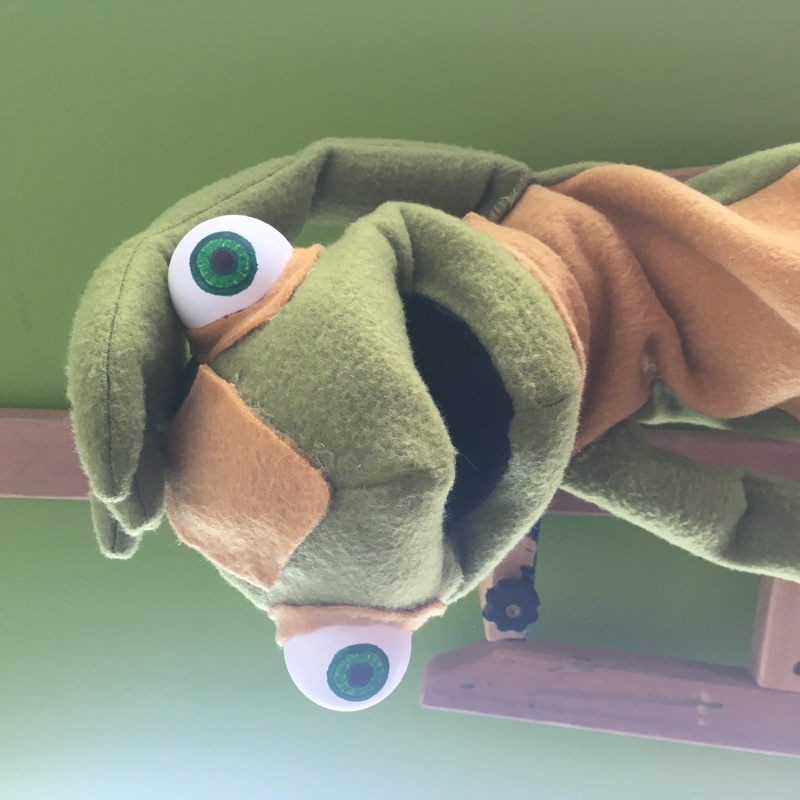 Since Drake was my third puppet, I felt confident enough to experiment with the design, particular when it came to character details. 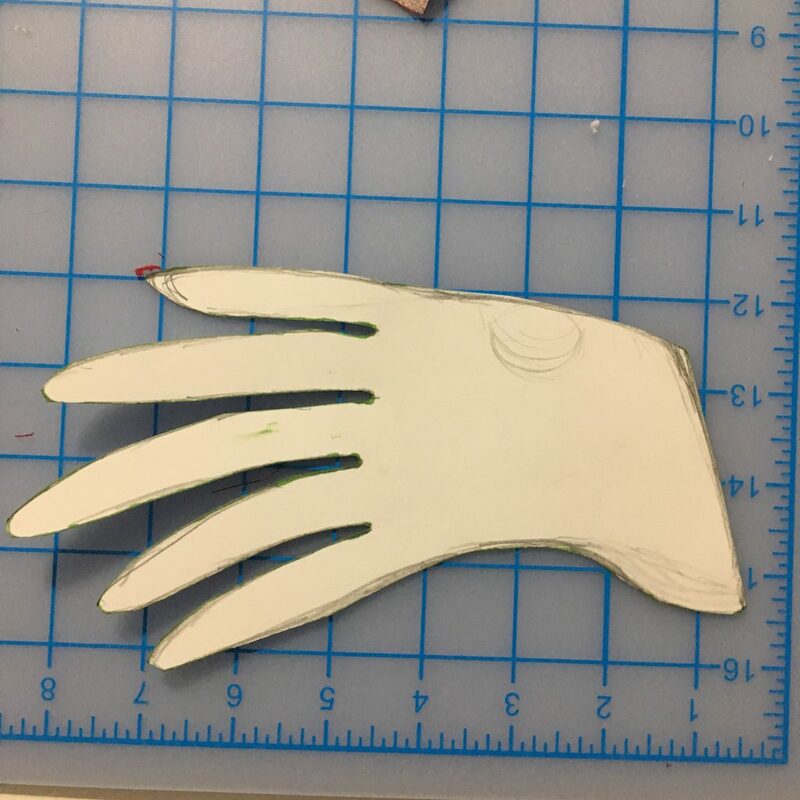 I had this vision of fringes and crests, and, measuring against the puppet’s face, I free-handed a pattern on a piece of cardstock, cut it out, and used the same technique that is used to machine-sew the hands of the puppets to sew my fringes. 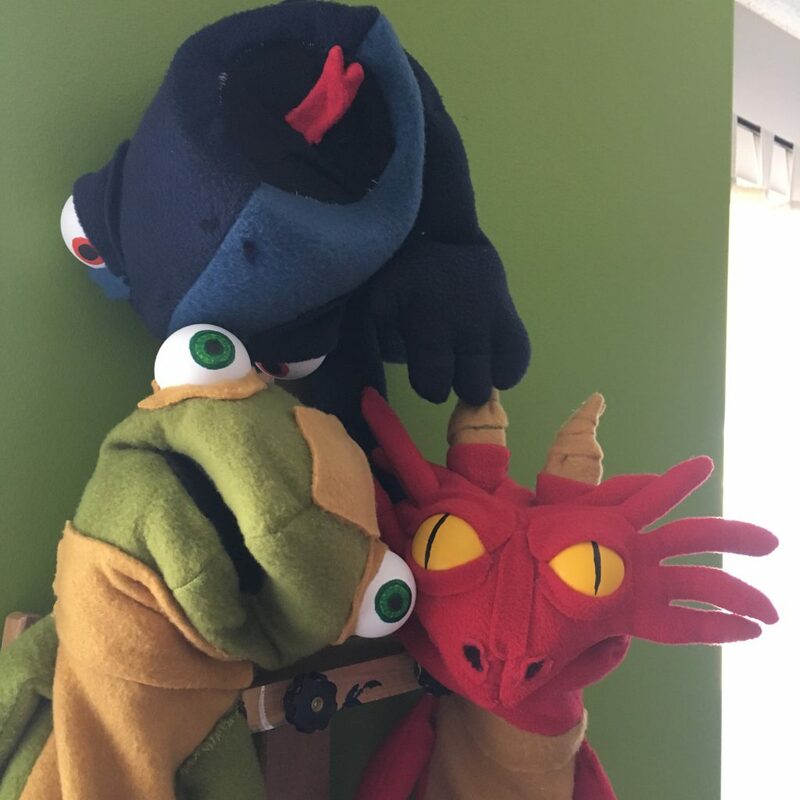 Yes, Drake is an obvious name for a dragon-inspired puppet, but I was also thinking of my Toronto friends who are huge Drake fans (in particular, the writers, artists and game designers). I spent the next few days working on Microbits/Neopixel code, and created a Git repository for this (not very reader-friendly but very small in size) code here. I used the Microbits coding environment and their drag-and-drop code along with the Adafruit Neopixels package/library for the environment. It was astoundingly easy to get things up and running. I ran into a persistent problem using repetitive loops (like the While loop and the loop that allows you to repeat code multiple times) — the code couldn’t be interrupted. That meant that I couldn’t turn the signal off when I wanted to. That felt clunky, so instead, the LEDs animate a few times, and then continue to be their rainbow selves until the other button is pressed and they are turned off (this is something that I just updated yesterday, but didn’t feel like I should separate from this section — it’ll still get its own timeline entry!). One major change was deciding to use one neopixel instead of two — basically, I didn’t want to have wires hanging around everywhere and the one LED seemed sufficient for the signal. Following that, I started to design vests to hold the electronics. 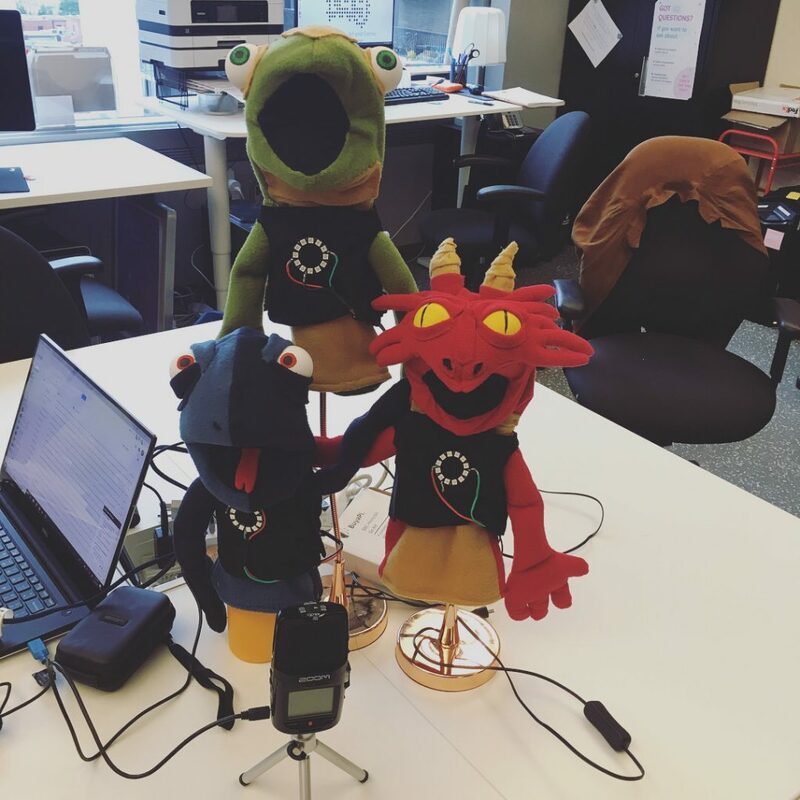 While I could have embedded them directly onto the puppets, I felt that it would be better not to damage the puppets and also easy to develop an agile, changeable solution if the electronics were on something that the puppets wore instead. The vests are perhaps not the most aesthetic things in the world, but on the whole, I think that they look fine. I only had time to start the basics before having to pack and get ready for CGSA. At first, I thought of using my cat’s harness pattern, but that seemed to take up too much fabric, and anyway, wasn’t based on the same shape as the puppets. This gave me the idea of using the existing puppet pattern as a base. So, using the larger puppet back pattern, I slightly altered the shapes and left room for arm holes. May 29th – June 2nd: I was at CGSA! A whirlwind of staying up too late and sewing tiny vests for puppets! After designing the shape and ensuring that it worked, I had to design a pocket for the batteries (which I talked through with Tom), a way of making the Microbits buttons easier to use no matter a person’s handedness/what hand they chose to put the puppet on, and decide on LED positioning. Tom helped me talk through the pocket decision, which due to the flexible positioning of the microbits (which are attached by velcro and can be repositioned), had to be in a specific orientation. Last night, I finished all three vests and they’re all in working order. June 4th: After finishing the vests, I tweaked the code, cleaning it up to reflect the single neopixel, turning down the brightness of the LEDs, and making it so that the second button turned the pixels to “black” or “off” instead of to the very-bright white setting. I am ready to draft rules of play for the game, but I have started to do some reading to familiarize myself a little bit with the literature on psychodrama and on sociodrama (which may actually be more what I am aiming for — systems and the experiences of a group rather than necessarily individual experiences). In terms of narrowing down the themes of the game, I have been thinking a lot about harassment, bullying, and microaggressions. This, I think, is the confluence of a few factors: some of my friends and colleagues have recently told me about harassment which they are experiencing, my own family is facing harassment and bullying, and I just watched Season 2 of Thirteen Reasons Why. So, I’ll be doing some reading and thinking before I sit down and commit to the rules. To really note all the overheard bits of conversation, all of the media that I am consuming (willingly or not, whether it’s the music playing in the grocery store, or an accidental glance at someone else’s phone, or all the myriad things I might scroll past on social media) that might have an influence on my process, and still have this project be manageable in scope is…just not possible. 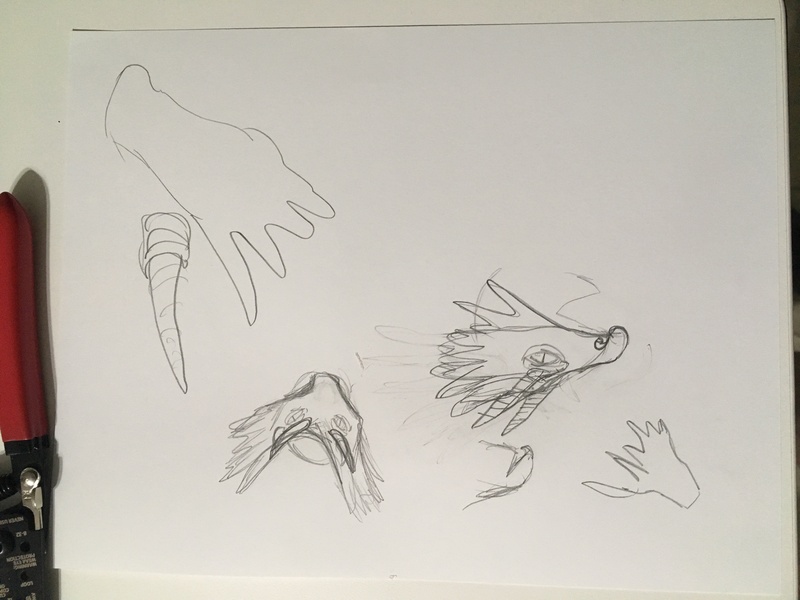 What I can do, and what I am doing is documenting, writing notes, and recording conversations when I can clearly say that yes, this is part of my design process. I am taking notes about the things that I am deliberately consuming and thinking about as part of this design process. But there is so much going on, and for both ethical and practical reasons, it can’t all go in. So, the data is necessarily incomplete. I guess I have to make peace with that. I already have hours of conversation recorded. On another note about productivity and scheduling: I was having a conversation with a friend and fellow designer this morning, and we were talking about what I’ll summarize as the concept of “lying fallow” — I’m not sure if others have used this term before… I feel like the answer to that is yes. These thoughts are also definitely influenced by Kara Stone’s CGSA talk, which is forthcoming as a paper, about Reparative Design. Increasingly, I am coming to recognize the importance of the times where a project is active but I am not working on it. This is something I think that I discussed in my writing earlier this year, in January and February, when I was experiencing burnout symptoms. Now that this idea has had the time to lie fallow, all of a sudden, things are just coming together. It’s a joy to work on it. It’s a joy to talk about it. But it needed that time. And so did I — I think that, like a field that has given all it has to grow the previous seasons’ crops, I needed to rest. I needed to be taking in information and thinking about the project without worrying too much about time. My past development cycles have definitely been about these bursts of activity, followed by refinement. Having given six months to each game project (eight in the case of the first one, though I’m hoping to not need all of those extra months, in order to be able to build more of a buffer), and knowing that I also have to do things like writing and editing (for my dissertation, for publication) as well as teaching, and y’know, taking care of my physical and emotional needs, I know that my schedule is a lot. It can be difficult to feel okay about lying fallow, but ultimately, the past year has shown me that it is a necessity.